Written and Directed by S. Craig Zahler, the critically acclaimed film stars Kurt Russell (The Hateful Eight, Tombstone), Patrick Wilson (The Conjuring, Insidious), Matthew Fox (ABC’s “Lost”), Lili Simmons ("Banshee"), Richard Jenkins (The Visitor), David Arquette (Scream) and Sid Haig (The Devil’s Rejects, House of Corpses). When a group of cannibal savages kidnaps settlers from the small town of Bright Hope, an unlikely team of gunslingers, led by Sheriff Franklin Hunt (Kurt Russell), sets out to bring them home. But their enemy is more ruthless than anyone could have imagined, putting their mission – and survival itself – in serious jeopardy. 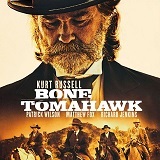 Kurt Russell leads an all-star cast, including Patrick Wilson, Matthew Fox and Richard Jenkins in this gritty, brutal adventure chronicling a terrifying rescue mission in the Old West. 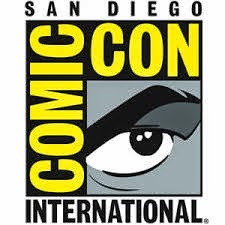 The film received the Best Director Award and Jose Luis Guarner Critic’s Award at the Sitges Film Festival in 2015. It was the closing night film at Fantastic Fest 2015 and the Q&A session from that event appears in the special features. The frontier town of Bright Hope has few residents. Sheriff Franklin Hunt (Kurt Russell) and Backup Deputy Sheriff Chicory (Richard Jenkins) keep the peace. When a stranger (David Arquette) comes to town, he appears to be up to no good. As he is known for doing, the Sheriff shoots the drifter in the leg. He is placed in a cell and the town doctor Samantha O’Dwyer is called. Samantha has her hands full at home with her cowboy husband Arthur (Patrick Wilson) who is laid up with a leg injury. Samantha is called to the jail to tend to the injured man. In the morning, she is nowhere to be found. A group of cannibal savages has taken the doctor along with other settlers. Quickly a team sets out to rescue the missing. In addition to the Sheriff and his backup deputy the doctor’s injured husband cannot be dissuaded from the rescue mission. 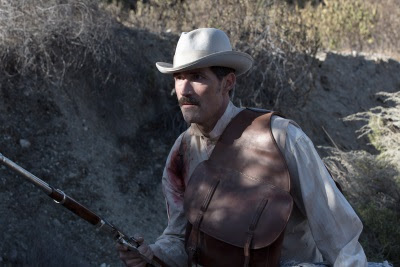 Gentleman John Brooder (Matthew Fox) doesn’t seem like your standard good guy but he joins the long journey to face the Troglodytes that have captured and possibly murdered their captives. I’m not a big fan of westerns but I quickly became intrigued by this story. The cast is small but perfectly cast. It amazed me how quickly, and with little information, you got the sense of what each character was about. It is instantly clear what the character of each man is. Although the chances are grim that the captives will be found alive you know that they will all be tested along the way. The film really got interesting when the viewer starts to think that all the men on this journey will not live to tell the tale. The film does have some extremely graphic, hard to watch death scenes. This is not for the squeamish. You will see more gore than you’d expect in a western. 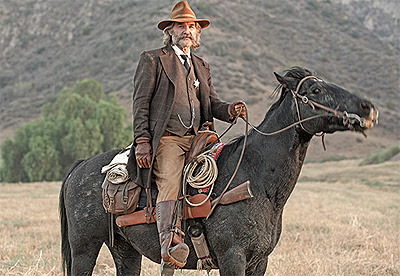 Bone Tomahawk is presented on Blu-ray in high definition with a widescreen 2.40:1 ratio. The Old West is dirty and you can see that in the detail of the clothes and the complexions of the stars. Care was taken with set design so you see the age of the wood and the texture of the walls inside the buildings. Varying shades of red are seen when you see dried blood on a tomahawk or the crimson hue of a fresh kill. The wound on Arthur O’Dwyers leg takes on many colors in its stages of infection. There is very little music in this film, but the DTS HD Master Audio 5.1 track does reveal a lot. You’ll hear the bugs in the night and assorted dangers approach from far away. The whistles from the Troglodytes are hollow and eerie while dialogue is intelligible and consistent. 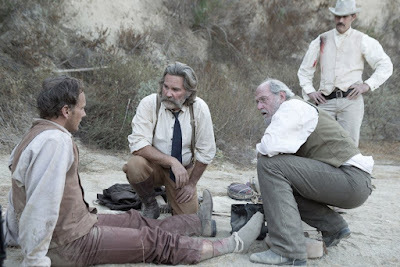 The Making of Bone Tomahawk (10:04) – A behind the scenes featurette with cast and crew interviews. The actors discuss how the dialogue drew them to the project and express their admiration for the writer/director and the cinematography on the indie film. Deleted Scene (2:30) – A deleted scene from the journey home that answers the question about what the survivors would do when they returned. Fantastic Fest Q & A with the Director and Cast (34:40) - The Director’s introduction before the film and audience Q & A that took place after the film. Poster Gallery - A series of posters for the film and its lead characters. 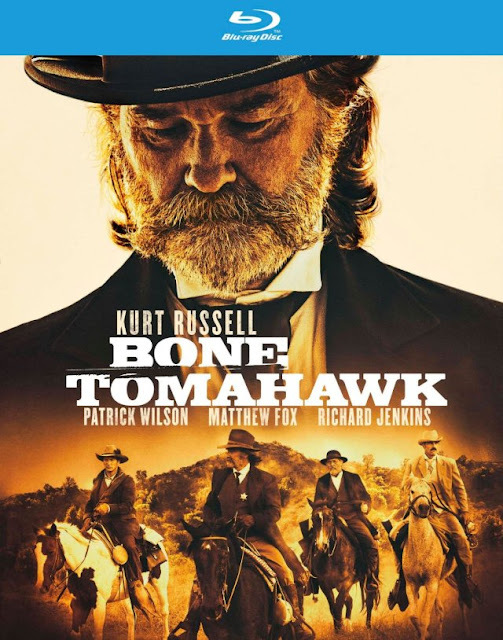 Bone Tomahawk was not at all what I’d expected. I enjoyed the film much more than I had anticipated. The writing is clever and the cast performs brilliantly. The violence and gore was unexpected and a little overboard for my tastes. The fact that it was hard to watch is because it all looks and seems so real. If you’re a fan of Kurt Russell and/or westerns I recommend giving this a chance if you have the stomach for it. To be fair, the scenes with the gore are limited but do leave a lasting impression.